I first heard about the Camino de Santiago through an offhand remark in National Geographic Traveler. 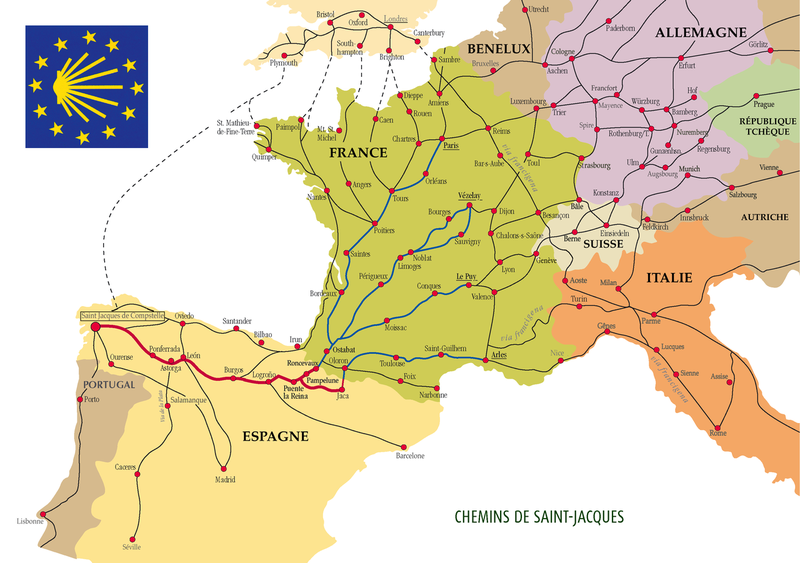 The Camino is an old pilgramage route that is over 1000 years old. People have been coming for centuries in order to visit the relics of St. James (Santiago in Spanish). It has many points of origin spread throughout Europe. Today, most people, including us, start in the town of St. Jean Pied-de-Port at the French-Spanish border and follow the red route on the map. From there it’s up and over the Pyranees on our way westward towards the town of Santiago de Compostela. We will be hiking between small villages and a few cities alternating between staying the night in cheap dorms tended by ancient monestaries and sleeping under the stars in our tent. From the moment I heard about it I’ve wanted to walk the trail. Reflection is a key part of the trek for me but so are the people I will meet. I’m expecting a fair bit of commoraderie to be generated by the tired feet and large dorms. And maybe we’ll even share a few good Spanish meals on our way. During the four weeks of our trek, we’ve scheduled some new posts for your enjoyment. We’ll be back in early October as we make our way (by train) from Santiago de Compostela to Madrid. Wish us luck! Hasta luego. Carmen, I totally know what you mean about being a planner! Good luck with your resolution! I know you can do it! And I cannot wait to hear all about it! Fun fact: That Proclaimer song holds a place near and dear to my heart because I did a 1st grade dance routine to that song! I can show you the super complicated moves when we meet! I want to see more than the moves, I want to see/learn the whole routine. Whatch out Bollywood, here we come.